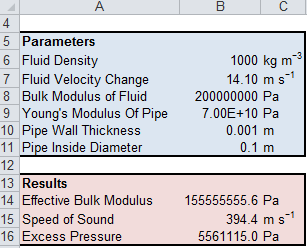 This Excel spreadsheet will calculate the maximum pressure surge when the valve at the end of a pipeline is closed. When flow is suddenly stopped, flow inertia causes a pressure surge at the valve, with a shockwave propagating through the pipeline. This is also known as Water Hammer and can cause considerable damage. Engineers need to know the maximum pressure surge to correctly design the pipe, valve andother fittings. Δv can be easily calculated by the Darcy-Weisbach equation. ΔP is also known as the Joukowsky Pressure. These equations do not predict the pressure surge arising from column separation (which may be higher than the Joukowsky Pressure). Column separation references the breaking of liquid columns in filled pipes.